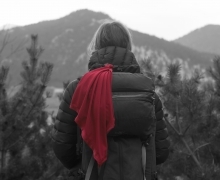 The Ultra Fast-dry Towel is the best travel towel I have ever used. Is small and compact, yet large enough to use as a full wrap around or beach towel. It wicks/dries very well and can be used as a pillow, cushion, etc. FAR better than any other travel towels I have used. The Ultra Fast-Dry Towel comes in 4 sizes and is available in 9 vibrant colors. Large - With 30-45 SPF protection, this popular size doubles as a cover-up. Thin and lightweight, it's the perfect travel towel. It takes very little space in luggage and makes an ideal in-flight blanket. Should you forget to pack your wicking pillowcase, the towel can be used on your pillow for comfort and cleanliness. Medium - Best for campers and backpackers when space is at a premium. The 28" x 34" size is a much appreciated gift for a baby shower. It's just right for baby's bath and can be used for a child's swim towel for years. Small - Sports enthusiasts use the small towel for keeping dry while working out or playing court sports. Many fitness clubs purchase this size for their members to wear around their neck while exercising. It is often used as a hand towel for RV's & sailboats, and is handy in the kitchen. Extra Small - When running or golfing, this compact towel can be tucked in a pocket, or attached to a belt or golf cart using the "gripping clips" that were created for this purpose. The extra-small size also makes a fabulous facecloth for travel. No more unpleasant smelling cotton facecloths! Many hotels no longer provide facecloths, so carrying your own is necessary. Are you looking to purchase towels for a team? Contact us to learn about team discounts. Please Note: If you select a size and a color choice does NOT come up, that simply means we are out of that size. Please keep checking back as stock changes daily. Washing Instructions for Discovery Trekking towels - Warm (or Hot) Water, detergent of your choice. Wash as you would a favorite t-shirt! Hang or dry in machine. Note: Should you find any smell lingering on your towels it is generally as a result of accumulation of body oil, lotions, deodorants, etc. To “unclog” the fibers and refresh your towel we recommend the following. Wash in warm or hot water without detergent, adding 1 cup of vinegar. Wash a 2nd time without detergent, adding ½ cup baking soda. They will be as good as new! This is a great tip for any clothing that may require freshening.